Leading 100% Export Oriented Unit of wooden undercut owls statue, wooden handcrafted owls, sandalwood owl sculpture, wooden birds statue, wooden carved owls and wooden owls statue from Jaipur. 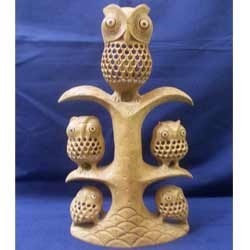 We are recognized in the industry for offering an extensive range of Wooden Undercut Owls Statue. Our uniquely designed lamp is widely admired by our clients for its sparkling appearance and multiple qualities which can enhance the beauty of your room. Further, it is thoroughly tested on various parameters by our expert before offering to our clients for assuring its flawlessness. Moreover, this statue is made available to the clients in varied designs, sizes and other specifications in order to meet their specific requirements. Owing to our vast industrial experience in this domain, we are devotedly engaged in offering a wide collection of Wooden Handcrafted Owls.The offered owls are designed with the help of premium quality wood and advanced technology under the guidance of experienced craftsmen. 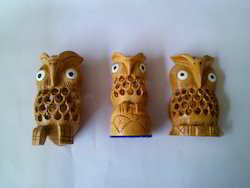 These owls are available in various attractive design and finish as per the requirement of our clients. Moreover, we provide the entire range to our clients at affordable prices. Owing to our expertise in this domain, we are engaged in providing top class Sandalwood Owl Sculpture which can create an unforgettable impact over the mind of modern generation. The offered sculpture is well designed from the finest quality raw material at our in-house production unit. Our provided sculpture is available in various sophisticated designs and sizes. The entire range is highly demanded by the clients for its excellent features.